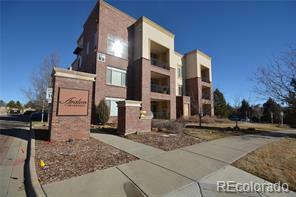 Turn key, upscale living in an exquisite south facing corner unit. Beautifully maintained building monitored with personally coded lobby door access. This beautiful home’s upgrades include 12ft ceilings and 9ft doors, open floor plan perfect for entertaining. Kitchen w/ granite island and stainless appliances, opens to the Great room and deck w/ fireplace and expansive south views. Master suite is bright w/ huge walk-in closet and second bedroom w/ full bath could easily be used as a study or guest suite. South facing deck has ample storage and a cozy outdoor fireplace. The unit also includes a rare two-car tandem attached garage w/ storage and one exclusive parking space. Location is exceptional – close to trails, light rail, restaurants, shopping, and DTC with unobstructed southern views.